As co-presidents of this prestigious musical organization, we are committed to ensure the Òhealth and welfareÓ of its members. With the forthcoming concert so close at hand , we have requested our conductor to submit his thoughts offering some helpful guidelines toward our success. Extending some simple courtesies can make participating in any directed ensemble an enjoyable and musically rewarding experience. The following is taken from a letter I drafted for the director of the San Francisco Early Music Society Recorder Workshop in 1992 after serving on the faculty. My experience as a teacher at that workshop led me to offer some advice to future participants that would help make classes run more efficiently and enhance the learning environment. While not all of the situations covered in this letter are applicable to MPRO, I believe that the issues dealt with are important for anyone who may be taking part in an ensemble with a leader. Please bring all of your instruments, music, materials, music stand and a pencil to each class. Plan to arrive at each class a few minutes early so that you can assemble your instruments and music stand and be ready to play when the class is scheduled to begin. If there is a problem getting from one class to another on time please contact the director so that a solution can be worked out. Please listen carefully to the instructions given during class. Try to avoid unnecessary conversation especially when instructions are being given. If you have a question during class please ask the instructor rather than another participant. The instructor will be more than happy to give you whatever information you need. Please take a few minutes between now and the beginning of the workshop to familiarize yourself with the following techniques, terms and expressions that are commonly used during rehearsals. For example, practice finding the measure numbers or rehearsal marks in any music you now have and then counting forwards and backwards from these numbers or marks. A little practice doing this with your own music now will enable you to easily find any starting point in the music you will be reading during rehearsals and save time for everyone. If you are reading from score and there are no measure numbers or rehearsal marks in the music, the instructor will identify starting points by referring to the page number of the score and the system on that page. A system consists of two or more staves that are meant to be played together and is often indicated by bracketing these staves on the left. Every time you begin at a new starting point make a mental note of where that starting point is in your music. The instructor may want to start from that spot again and simply say, ÒBegin at the same place.Ó When you are working on music that consists of several separate sections or movements, Òback to the beginningÓ means go back to the beginning of the section or movement you are working on, not to the first section or movement of the piece. The instructor will make it clear if he or she wishes to switch to a section or movement other than the one that you have just played. When an instructor stops beating time and drops his or her hands please stop playing immediately unless otherwise instructed. This will make it easier to continue the rehearsal with a minimal amount of delay. Everyone makes mistakes sometimes---even the instructors! Mistakes are a normal part of rehearsals. If you make a mistake, everyone understands because theyÕve made mistakes too, and you donÕt have to go into long explanations or apologies. Ask the instructor how you can avoid making the mistake and try again. If you are concerned about a mistake you have made or a problem you are having arrange to see the instructor after class. All of the instructors want you to play your best and are more than willing to give you the help you need. Listed below is the music for the orchestra's next three meetings. Once again, there will be sectional seating for the Bassano motet, with those in the Primus Chorus sitting on the right as they face the conductor and those in the Secundus Chorus on the left. Please observe this seating arrangement when you choose your place at the beginning of the meetings on April 21 and May 12. Please note that dulcien as well as sopranino, great bass and contrabass recorders will be needed at all three meetings and that krummhorns will be needed on April 21 and May 12. Finally, please be aware that the meeting on April 28 was not on the orchestraÕs original schedule at the beginning of the season but was added after the cancellation of the meeting on February 17. Eileen Hadidian (BA in Music, 1972), founder and artistic director of Healing Muses, has been named Albany Woman of the year for 2010. The announcement was made by California State Assemblywoman Nancy Skinner. Eileen was one of a select group of women to be so acknowledged by community leaders in East Bay Assembly District 14. Eileen and 13 other women, each representing one city in SkinnerÕs district, were chosen because they have gone above and beyond the call of duty to make a significant difference in their communities. They will be honored at a special luncheon in Berkeley, CA, during WomenÕs History Month festivities this March. Richard Roper & Robert Wilkins (trumpets), Don Benham, Frank Bunger, Mike Coshing (trombones) share their passion for chamber music and glorious works from the Renaissance. Program includes music by Palestrina, Schein, Isaaac. 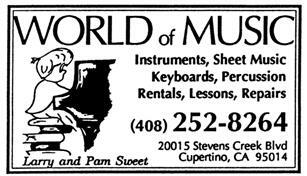 Some of the Bay AreaÕs most skilled and talented recorder consorts and mixed ensembles. The Belmont Consort, The Cupertino Crones, Recorder Journey, and others come together to perform early music as well as recent compositions.